Altaflex Srl offers seven different ways to be next to people’s very nature. We have studied an innovative project that tries to satisfy everyone’s need. All covers have a zip on the 4 sides, in order to divide it completely. 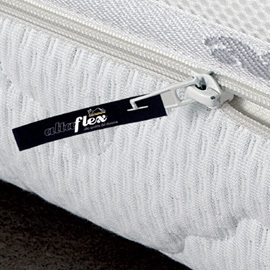 Some fixed and removable covers have a breathable 3D side band for a perfect ventilation of the mattress. The Aloe Vera padding is made by three layers: The summer side has an external part made of linen padding; the external part of the winter side has a padding made of pure new wool. Bayprotect is a non-allergical, breathable and soft cover perfect for people suffering from allergies to pollen. It can be machine washed 60°. Coolmax is a high performance fabric that is made of an innovative and high technological fibre. Thanks to its special properties it regulates the temperature and the skin hydration. The fabric Thermo+ is a fabric that regulates the temperature, capable of providing all the extraordinary advantages and unparalleled comfort, without compromising an ideal micro-climate for sleeping. The Polygiene treatment, is a argent salt based fabric, that neutralizes odors and the formation of mold and ensuring increased levels of hygiene. Silver ions are anti-bacterial penetrating their cells. 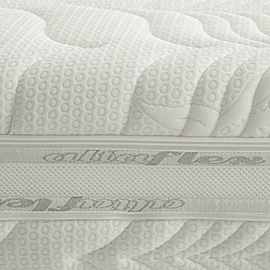 Lavanda is a non-allergenical and breathable cover, with its delicate smell guarantees a relaxed and comfortable sleep. 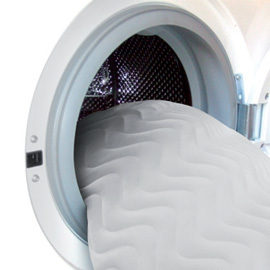 The cover is machine washable at 60°. It is a particular fabric that can neutralize molds and bacteria reducing allergic reactions. It can be machine washed at 60°.